RENT ISN’T TALKED ABOUT much in polite society; it’s the 800-pound gorilla everyone pretends isn’t there. Economists in particular rarely mention it, not out of ignorance but because they find it awkward to offend those who collect it disproportionately. The time has come, though, to bring rent out of the closet, for it holds the key to saving both our middle class and planet. What is rent? It is much more than the money you pay for your apartment. The term was first used by classical economists, including Adam Smith, to describe all money paid to land owners. It was one of three income streams in the early years of capitalism, the others being wages paid to labor and interest paid to capital. In Smith’s view, landlords benefited from land’s unique ability to enrich its owners “independent of any plan or project of their own.” This ability arises from the fact that the supply of good land is limited, while the demand for it — and hence the price — steadily rises. The effect of landowners’ collection of rent, he concluded, isn’t to increase society’s wealth but to take money away from labor and capital. In other words, land rent is an extractor of wealth rather than a contributor to it. More recently, the concept of rent was expanded to include mono­poly pro­fits, the extra income a company reaps by quashing com­pe­tition and raising prices. This kind of rent derives from the fact that prices in capitalism are driven by four factors: supply, demand, market power and politi­cal power. The first two, which are omnipresent in economics texts, deter­mine what might be called fair market value; the last two, which are ubiquitous in the real world, determine rent. Actual prices charged are the sum of fair market value and rent. Another way to say this is that rent is the extra money people pay above what they’d pay in truly com­pe­titive markets. Lately the term has also been applied to income from privileges granted by government — import quotas, mining rights, subsidies, tax loop­holes and so on. Many econo­mists use the term “rent-seeking” to describe the multiple ways special interests use govern­ment to enrich them­selves at the expense of others. If you’re wondering why Washington, D.C. and its envi­rons have grown so prosperous in recent decades, it’s not because govern­ment itself has become gargantuan, it’s because rent-seeking has. BECAUSE RENT ISN’T LISTED separately on any price tag or corpor­ate in­come statement, we don’t know exactly how much of it there is, but it’s safe to say there’s quite a lot. Consider, for example, health care in America, about one-sixth of our economy. There are many reasons the U.S. spends 80 percent more per capita on health care than does Canada, while achieving no better results, but one of the biggest is that Canada has wrung huge amounts of rent out of its health care system and we haven’t. Every Canadian is covered by non-profit rather than profit-maximizing health insurance, and pharmaceuti­cal prices are tightly controlled. By contrast, in the U.S., drug companies overcharge because of patents, Medicare is barred from bargaining for lower drug prices, and private insurers add many costs and inefficiencies. We could wander through other major industries — energy, tele­com­muni­ca­tions, broadcasting, agriculture — and find similar ex­tractions of rent. What percentage of our economy, then, consists of rent? This is a question you’d think economists would explore, but few do. To my knowledge, the only prominent economist who has even raised it is Joseph Stiglitz, a Nobel laureate at Columbia University, and he hasn’t answered it quantitatively. A perfect example of virtuous rent is the money paid to Alaskans by the Alaska Permanent Fund. Since 1980, the Permanent Fund has distributed equal yearly divi­­dends to every person who resides in Alaska for one year or more. The divi­dends — which have ranged from $1,000 to $3,269 per person — come from a giant mutual fund whose beneficiaries are all the people of Alas­­ka, present and future. The fund is capitalized by earnings from Alaska’s oil, a commonly owned resource. Given the steady flow of cash to its entire pop­u­la­tion, it’s not surprising that Alaska has the highest median income and one of the lowest pover­ty rates of any state in the nation. More generically, virtuous rent is any flow of money that starts by raising the cost of harmful or extractive activity and ends by increasing the incomes of all members of society. Another way to think of it is as rent that we, as collective co-owners, charge for private use of our common assets. Think, for example, of charging polluters for using our common atmosphere and then sharing the proceeds equally. Traditional rent is collected by businesses whose market and/or political power enables them to charge higher-than-competitive prices. It leads to higher prices that serve no economic, social or ecological function. Virtuous rent, by con­trast, would be collected by not-for-profit trusts that represent all mem­bers of a polity equally. It would be generated by charging private busi­nesses for using common assets that most of the time they use for free. Such rent would also lead to higher prices, but for good reasons: to make busi-ness­es pay costs they currently shift to society, nature and future genera­tions, and to offset traditional rent. 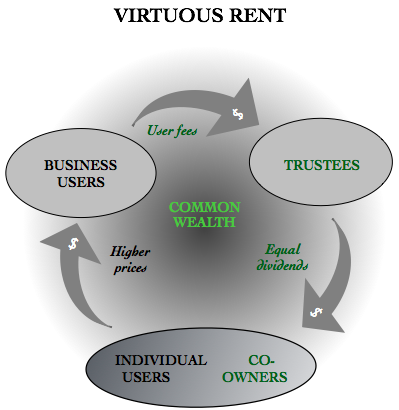 Common wealth has several components. One consists of gifts of nature we inherit together: our atmosphere and oceans, water­sheds and wetlands, forests and fertile plains, and so on (including, of course, fossil fuels). In almost all cases, we overuse these gifts because there’s no cost attached to using them. Another component is wealth created by our ancestors: sciences and techno­lo­gies, legal and political systems, our financial infra­structure, and much more. These confer enormous benefits on all of us, but a small minority reaps far more financial gain from them than most of us do. Yet another chunk of common wealth is what might be called “wealth of the whole” — the value added by the scale and syner­gies of our economy itself. The notion of “wealth of the whole” dates back to Adam Smith’s insight that labor specialization and the exchange of goods — pervasive features of a whole system — are what make nations rich. Beyond that, it’s obvious that no business can prosper by itself: all busi­nesses need cus­­tomers, suppliers, distributors, highways, money and a web of comple­men­tary products (cars need fuel, software needs hardware, and so forth). So the economy as a whole is not only greater than the sum of its parts, it’s an asset without which the parts would have almost no value at all. The sum of wealth created by nature, our ancestors and our econ­omy as a whole is what I here call common wealth. Several things can be said about our common wealth. First, it’s the goose that lays almost all the eggs of private wealth. Second, it’s extremely large but also (like traditional rent) mostly invisible. Third, because it’s not cre­ated by any indivi­dual or business, it belongs to all of us jointly. And fourth, because no one has a greater claim to it than anyone else, it belongs to all of us equally. The big, rarely asked question about our current economy is who gets the benefits of common wealth? No one disputes that private wealth creators are entitled to the wealth they create, but who is entitled to the wealth we share is an entirely different question. My contention is that the rich are rich not because they create a large amount of wealth, but because they capture a larger share of common wealth than they’re entitled to. Another way to say this is that the rich are as rich as they are — and the rest of us are poorer than we should be — because extracted rent far exceeds virtuous rent. If that’s the case, the appropriate remedy is to diminish the first kind of rent and increase the second kind. EXTERNALITIES are a better-known concept than common wealth. They’re the costs businesses impose on others — workers, communities, nature and fu­ture generations — but don’t pay themselves. The classic example is pollution. These aren’t trivial questions. In fact, they’re among the most momentous questions we must address in the twenty-first century. The sums involved can, and indeed should, be very large — after all, to diminish harms to nature and society, we must internalize as many unpaid costs as possible. But how should we collect the money, and to whom should it go? In theory Pigou’s idea makes sense; the trouble with it lies in implementa-tion. No western government wants to get into the business of price-setting; that’s a job best left to markets. And even if politicians tried to adjust prices with taxes, there’s little chance they’d get them “right” from nature’s per-spective. Far more likely would be tax rates driven by the very corporations that domi­nate government and overuse nature now. As for whose money it is, it follows from the above that payments for most externalities — and in particular, for costs imposed on living creatures present and future — should flow to all of us together as beneficiaries of common wealth. They certainly shouldn’t flow to the companies that impose the exter­nalities; that would defeat the purpose of internalizing them. But neither should they flow to government, as Pigou suggested. THERE ARE SEVERAL further points that can be made about virtuous rent. First, paying virtuous rent to ourselves has a very different effect than paying extractive rent to Wall Street, Microsoft or Saudi princes. In addition to dis­couraging overuse of nature, it returns the money we pay in higher prices to where it does our families and economy the most good: our own pockets. From there we can spend it on food, housing or anything else we choose. Such spending not only helps us; it also helps businesses and their employ-ees. It’s like a bottom-up stimulus machine in which the people rather than the government do the spending. This is no trivial virtue at a time when fiscal and monetary policy have both lost their potency. Second, virtuous rent isn’t a set of government policies that can be changed when political winds shift. Rather, it’s a set of pipes within the market that, once in place, will circulate money indefinitely, thereby sustaining a large middle class and a healthier planet even as politicians and policies come and go. No­tice that there are no taxes or government programs in the above diagram. The money collected is in the form of prices for value received. The money distributed is property income paid to owners. Lastly, though virtuous rent requires government action to get started, it has the political virtue of avoiding the bigger/smaller government tug-of-war that paralyzes Washington today. It thus can appeal to voters and politicians in the center, left and right. Consider the board game Monopoly. The object is to squeeze so much rent out of other players that you wind up with all their money. You do this by acquir­ing land monopolies and building hotels on them. However, there’s another fea­ture of the game that offsets this extracting of rent: all players get an equal cash in­fusion when they pass Go. This can be thought of as virtuous rent. As Monopoly is designed, the rent extracted through monopoly power greatly exceeds the rent players receive when pass­ing Go. The result is that the game always ends the same way: one player gets all the money. But sup­pose we tip the scale the other way. Suppose we decrease the extracted rent and increase the virtuous kind. For example, we could pay players five times as much for passing Go and reduce hotel rents by half. What then happens? Instead of flowing upward and concentrating in the hands of a single winner, rent flows more evenly. Instead of the game ending when one player takes all, the game continues with many players receiving a steady flow of income. The player with the most money can be declared the winner, but she or he doesn’t get everything and other players needn’t go bankrupt. The point here is that different rent flows can steer a game — and more importantly, an economy — toward different outcomes. Among the out­comes that can be affected by differing rent flows are the levels of wealth con­cen-tration, pollution and real investment as opposed to specu­lation. Peter Barnes is writer and entrepreneur whose work has focused on fixing the deep flaws of capitalism. He has co-founded several socially responsible businesses (including Credo Mobile) and written numerous articles and books, including Capitalism 3.0 and With Liberty and Dividends For All.